I loved this piece on Les Miles and the undertaking at Kansas. What will win out between the coaching graveyard that is Kansas football (they’re the Cleveland Browns’ quarterback job of the NCAA) and Les Miles’ capacity as a motivator and recruiting connections? 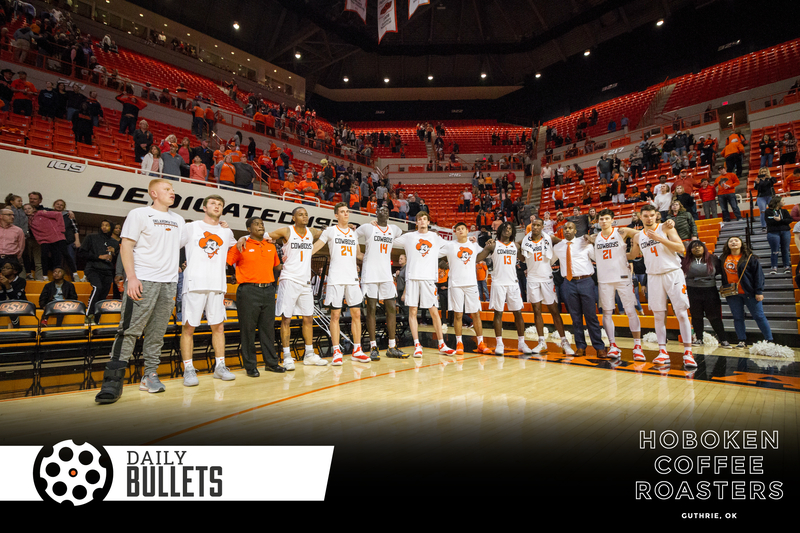 • One of the wilder aspects of this Cowboy Basketball season is how recently it was held that the Pokes had signed too many players. When Marcus Watson committed, the roster was set to be oversized for the 2019-2020 season with one scholarship player too many. • Mike Boynton spoke on the importance of continued discipline within the program. “I’ve gotten advice from a lot of coaches that it’s a big part of the job, discipline, and if you have standards, they only mean something if you enforce them,” Boynton said. What a fine line for a coach to have to learn to walk. You can bend your rules and maximize your talent while risking an “inmates running the asylum” scenario or you can draw a line and hope enough talent can stay on the right side of that line for you to develop a winning roster. • The Cowboy football spring game (April 20th) is setting up for a fun weekend in Stillwater. • Cowboy guard/forward Lindy Waters went from youth on the fringes of trouble to locking down lottery picks and swimming back into the good graces of division one basketball. If you’re a Waters fan, make sure and check out the read. It was cool to hear about how his Native American roots and “rez ball” shaped and improved his game (on top of influencing youth in positive ways). • A fun look at college football national champs over time. • A look at the teams with first-round picks at QB since Ohio State had one. All Mike Yurcich has to do is get a QB drafted in the first with his choice of talent across the country and he’ll look like a wunderkind. • Finished this terrific fiction read about a family in a small-town – easily my favorite book to date this year (Educated and The Tattooist of Auschwitz were both incredible too). You can see what I’ve read so far in 2019 here.